Specifics on the proposed increase in 2019 and a second four-percent hike in 2021 weren't immediately clear and won't be known until public hearings in the fall or winter. A 2017 hike likewise bumped fares on the subways, buses, Metro-North and Long Island Railroad by 4 percent, but kept the base subway fare at $2.75. Andrew Siff reports. 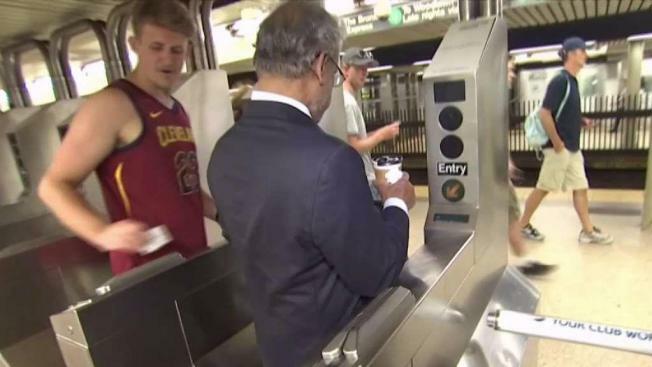 The MTA on Wednesday said it plans to increase fares by 4 percent each in 2019 and 2021. The semi-annual increases would constitute the sixth and seventh hikes since 2009 --when base subway and bus fares were bumped from $2 to $2.25. The upcoming hikes have also been part of a long-planned increases every other year dating back to that year. MTA officials said that even with the planned hikes, it is projecting significant deficits over the next several years. Officials on Wednesday blamed the budget gap on a second straight year of declining ridership as well as lower real estate revenues than expected. The proposal comes a year after Gov. Cuomo declared a state of emergency for the subways last summer. MTA chairman Joe Lhota said Wednesday the state of emergency remains in place, as does the Subway Action Plan aimed at improving service.